Following the end of the First World War, America had a large surplus of DH-4s, with the improved DH-4B becoming available, although none had been shipped to France. It was therefore decided that there was no point in returning aircraft across the Atlantic, so those remaining in France, together with other obsolete observation and trainer aircraft were burned in what became known as the "Billion Dollar Bonfire". With limited funds available to develop and purchase replacements, the remaining DH-4s formed a major part of American air strength for several years, using them for many roles, with as many as 60 variants produced. DH-4s were also widely used for experimental flying, being used as engine testbeds and fitted with new wings. They were used for the first trials of air-to-air refueling on 25 June 1923, and carried out an endurance flight of 37 hours, 15 minutes on 27–28 August, being refueled 16 times and setting 16 new world records for distance, speed and duration. 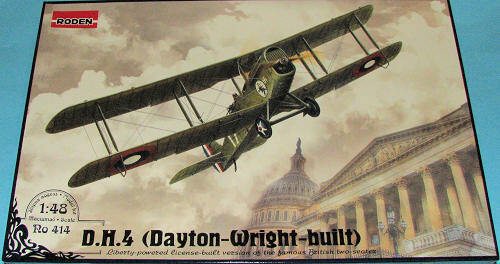 The DH-4 remained in service with the United States Army until 1932. 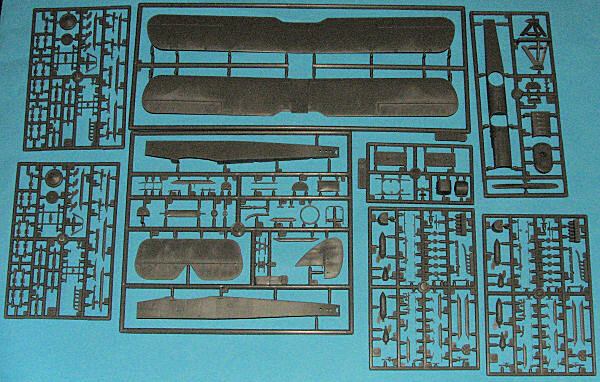 The kit is molded in Roden's usual medium grey plastic. There are nine sprues, of which two are duplicated. The overall detailing is very good, as we have come to expect from Roden over the years. Just looking at things, you can see that this is not a small aircraft. While some consider 1/32 to be the perfect scale for WWI models, for many like this one, 1/48 is more shelf friendly. As we would expect, there is a lot of detail in this one from a very nicely appointed interior, complete with sidewall framework detailing, to an accurate set of guns and a comprehensive bomb load. Judging by all that is able to be carried, I dare say that any mission with a full load would need to be short. I imagine that normal bombing operations would be carried out from airfields very close to the front lines. Roden has always done a good job of replicating fabric surfaces and this kit is no exception. The kit does not have a full engine as in some others, but there are block segments on which to attach the exhaust as so you won't see a blank plate when looking through the prop attachment point. As you look at the parts layout, very few of those parts are not used in this build. Instructions are excellent and provide clear and concise construction drawings; all 19 of them. Color information is supplied via Model Master references and there are a few areas that will need holes drilled. A full rigging diagram is provided and one can use the box art to help out as well. Markings are provided for three aircraft. Two are OD over unpainted linen, one being with the 20th Aero Squadron and the other with the USMC C Squadron. The third is overall Olive Green with the 11th Aero Squadron. All are France based in 1918. Decals are very nicely printed (the image has been darkened to show the white bits). Roden decals have been less than perfect in the past though these do look to be very nice. This really is a very nice kit. WWI fans should be delighted to have it and though the rigging will challenge some, the end result will be superb.